The Montgomery County "Safe Speed" program recently announced plans to install several new fixed location speed cameras. Some of these cameras have recently been activated on route 28 in the small town of Darnestown Maryland and have been placed immediately after signs reducing a 40mph speed limit to 30 mph. The following photos, taken by a concerned Montgomery County resident, show the placement of the cameras with respect to the speed limit signs. Just west of Quince Orchard Road, the speed limit on rt 28 becomes 40mph. Just before entering Darnestown is the first 30mph speed limit sign, with one small "photo enforced" sign. Well under a tenth of a mile later is the new fixed speed camera (circled in image below, click for full sized image). The two are close enough that both the camera and the sign can be photographed together, although brush along the side of the road might well conceal the cameras until a driver actually reaches them. A photo taken from the eastbound direction shows a 40mph sign just past the camera (circled in this image, click for full sized image). At the western end of Darnestown, the situation is even more obvious. When heading east on rt 28, the speed limit is 50mph, with no speed limit signs for over a mile, until about 2/3 of a mile before the speed camera location, at which point the speed limit becomes 40mph. The camera is placed IMMEDIATELY AFTER the only 30mph sign with a small "photo enforced" sign. The camera itself is partially obscured behind another sign. This picture shows how incredibly close the two were placed. Viewed from the westbound direction, the 40mph sign can be seen (circled below, click for full sized image). In neither direction are there any flashing yellows "Your Speed" indicator signs, rumble strips or other traffic calming devices to alert inattentive drivers, which one would expect if safety were the motive and the county wished to be sure drivers had every possible chance to react to the single speed limit sign before entering town. There are also no signs indicating a school zone. Note that these fixed speed cameras are designed to work 24/7, the cameras and signs would be much less visible at night. The cameras were seen "flashing" several cars in a row, all of which seemed to be driving in what most people would consider a normal, safe manner. Because there is so little space between the signs and the cameras even someone who is fairly diligent about obeying speed limits could easily get "nailed" if they were to try to save gas by coasting down to speed instead of immediately hitting the brakes. However it is unclear whether they are actually issuing citations, as someone was apparently already so angered by the camera placement that they spray painted over the lenses of at least one camera. Speed cameras are frequently targeted by this and other forms of attack almost everywhere they have been used. 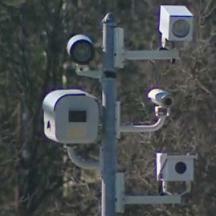 Two more Darnestown cameras are being constructed nearby on Germantown road (rt118). The fixed poles are located 0.2 miles east of the intersection with rt28 (where the speed limit is 40mph), and about 0.1 miles south of the first 30mph speed limit sign. North of the new locations the speed limit is 40mph. Worse yet, a driver (perhaps your visiting friend or relative) who knows nothing about speed cameras, coming south from 118 and turning east on rt28 could plausibly hit two cash-cow cameras right after another, then hit both cameras again in the opposite direction on the return trip. Montgomery County is facing the prospect of a huge budget deficit in 2009, and council president Phil Andrews has proposed using speed cameras to fund various programs which the council had previously hoped to fund with a new ambulance fee. A minor dispute arose from this because the County Executive had already allocated the speed camera funds for his own pet projects. Also, revenues from existing cameras have declined by about 40% in the second half of 2008 as more and more drivers became aware of the locations. Local municipalities have also been looking for their cut, with Chevy Chase Village in particular profiting greatly from the cameras. While speed camera funds are nominally required to be used for public safety, that term is undefined. Chevy Chase Village board members have stated that portions of most items in their operating budget could be funded by the cameras, and have allocated safe speed funds for items such as a new locker room, a new office for the village chief of police, and purchasing a Segway. When Takoma park joined the county's contract, they allowed the camera contractor, ACS (who receives $16.25 out of every citation) to conduct the traffic surveys which help determine where cameras are placed. It is unclear whether it was ACS or county officials who decided to chose camera location and orientation in Darnestown which minimize driver reaction time and thus create this highly profitable scenario. Montgomery County is in the process of installing several more new cameras (see locations of planned and existing cameras here). StopBigBrotherMD.org requests that anyone discovering a camera which subjects drivers to the type of unfair enforcement as is being done in Darnestown please contact us. Meanwhile, those drivers who live, work, and pay taxes in Montgomery County should assume they will be subjected to this type of "zero tolerance" photo enforcement. Those who are only visiting should consider spending their money elsewhere.